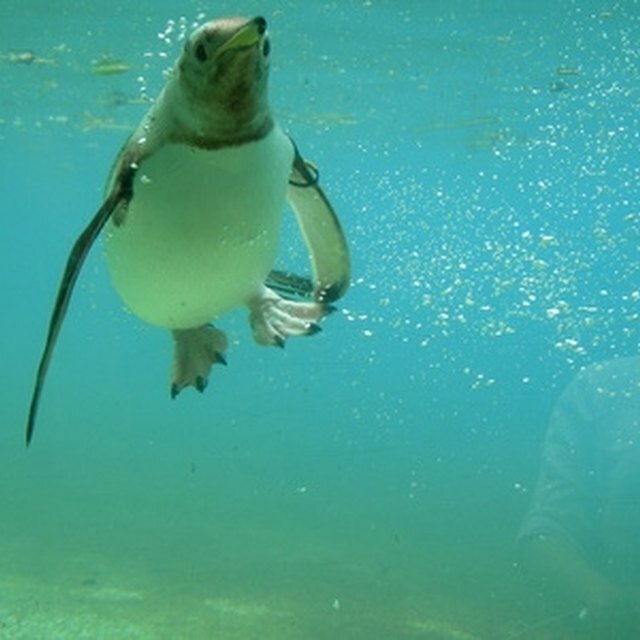 How Do Penguins Breathe Underwater? What Are the Functions of the Ampulla on a Starfish? How Long Can a Dolphin Hold its Breath? Dolphins are aquatic mammals that are members of the whale family, with many different species living in the world's oceans and seas. Dolphins have a pair of lungs and breathe through a blowhole on the top of their heads. They sometimes have to dive very deep to catch the fish and other animals that they eat. So how long can a dolphin hold its breath? The average dolphin species can stay underwater for as long as eight to 10 minutes; some can remain submerged while holding their breath for 15 minutes. Dolphins breathe through their blowhole, which has a muscular flap that covers it when they go under water, keeping water out of their lungs. A dolphin's lungs are the same size in relation to their body as other mammals. What allows them to hold their breath as long as they can is the fact that they contain more alveoli, or tiny air sacs, in each lung. There are two layers of oxygen-carrying capillaries instead of the one found in most mammals, and the membrane surrounding the lungs is elastic and thick. These differences allow the dolphin to have a much more efficient exchange of gases from the lungs to the bloodstream. Dolphins are aided by the fact that they can use a sort of selective circulation process; when diving, the blood flow to the skin, digestive system and outer extemities slows down or stops altogether. This leaves the heart, brain and tail muscles able to still function. The atmospheric pressure of a deep dive forces air out of the lungs and into the nasal passages and forces blood from the heart into a complex network of capillaries. The dolphin is able to squeeze every bit of oxygen from its lungs in this way to stay down. Humans that went down as far as dolphins do and then came up would develop the decompression sickness known as the bends, since they are breathing highly compressed air as they dive. But since dolphins are simply holding their breath they do not suffer the same consequences. Dolphins do not drown when they sleep because they are able to float just beneath the surface of the water due to their bone structure and differences in their lungs from other mammals. This makes them more buoyant, and small movements of their tail flukes propel them to the surface so they can take a breath every now and then as they sleep. What Are the Manatee's Adaptations for Survival? Lindell, John. "How Long Can a Dolphin Hold its Breath?" Sciencing, https://sciencing.com/can-dolphin-hold-its-breath-4598087.html. 13 March 2018. How Does a Giraffe Breathe?